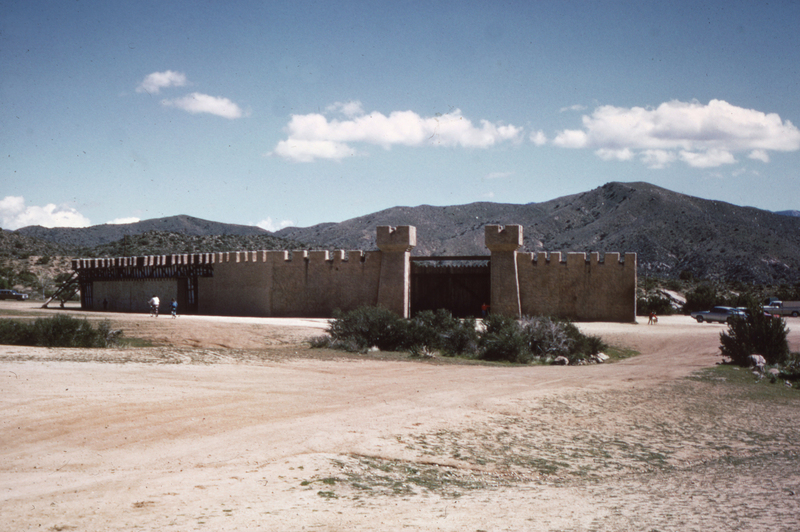 SCVHistory.com LW3045 | Vasquez Rocks | Fort Set, 'Tales of the 77th Bengal Lancers' (Photos 1968). Fort Set, "Tales of the 77th Bengal Lancers"
Abandoned "Fort" set at Vasquez Rocks County Park. Color transparencies, 1968. 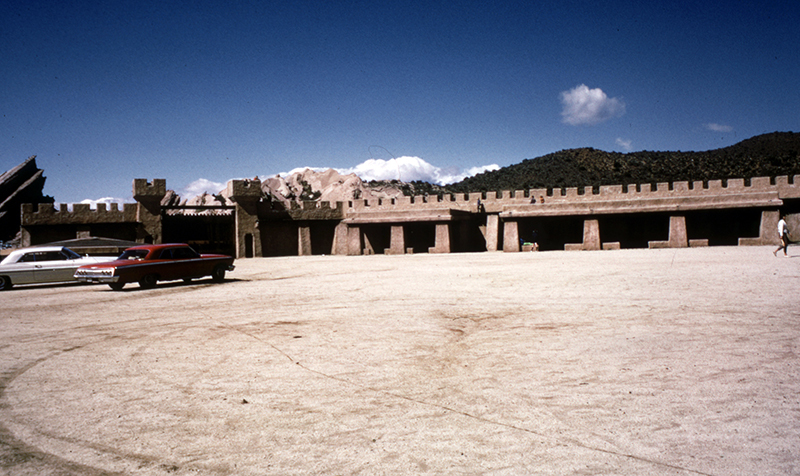 At one time, a fort sat on the property on the level field between the major rock formations and the current 14 Freeway. The fort was built for the television show "Tales of the 77th Bengal Lancers" from Screen Gems, a Columbia Pictures subsidiary, erected at a cost of $117,843.17. "Tales of the 77th Bengal Lancers" lasted one season on NBC (26 episodes, 1956-1957) and starred Philip Carey, Warren Stevens	and Patrick Whyte. 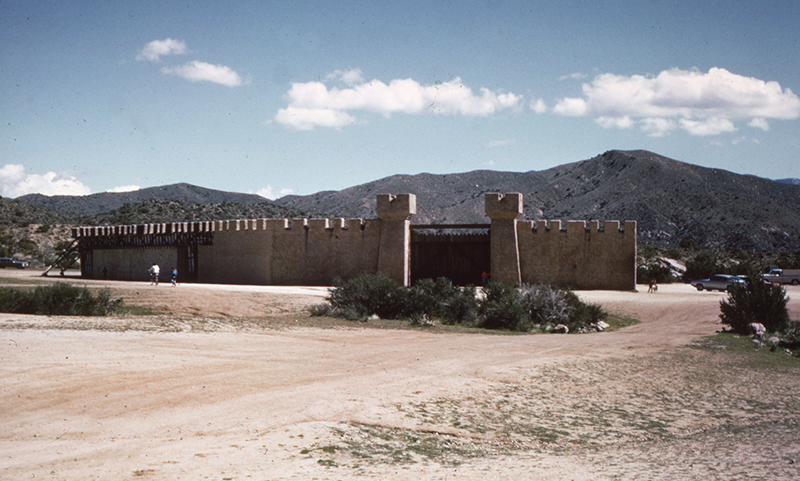 The fort appeared in many subsequent productions including the "Star Trek" episode "Arena" (air date Jan. 19, 1967) where Captain Kirk (William Shatner) fights the Gorn commander (Sand Canyon resident Bobby Clark). In the early 1970s the County of Los Angeles removed the fort, which was reportedly made of 2x4's, chicken wire and plaster. It was gone by 1974 ("Blazing Saddles"). LW3045: 9600 dpi jpeg from original color transparencies purchased 2017 by Leon Worden. FORT SET FROM "TALES OF THE 77TH BENGAL LANCERS"